john4jack (Corvallis, Oregon, United States) on 5 December 2013 in Architecture and Portfolio. How I envy you this clean light . . and what honesty the building carries. Like this little church, a typical architecture ! Beautiful view of this small church against the deep blue sky. Wonderful colors! Une superbe église! très belle photo!!!!! I especially like this colors.! An impressive shot of shade/sunlight control. Very well done. Beautifully-rich colors that you've captured here! They contrast well with each other. Impressive shot with glorious light and detail. On ne doit pas être très loin du Mexique, non? Beautiful church, and I like your composition. 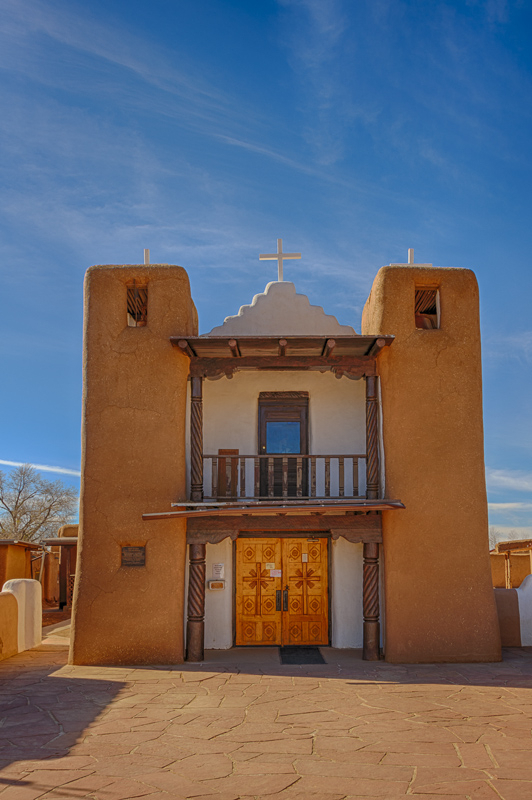 Lovely example of New Mexico style. A neat shot of this excellent old adobe church. Lovely chapel. I love the solid structured architecture.